The first step in threat prevention is enabling security teams to have a complete view of what is on the network – across the entire enterprise. 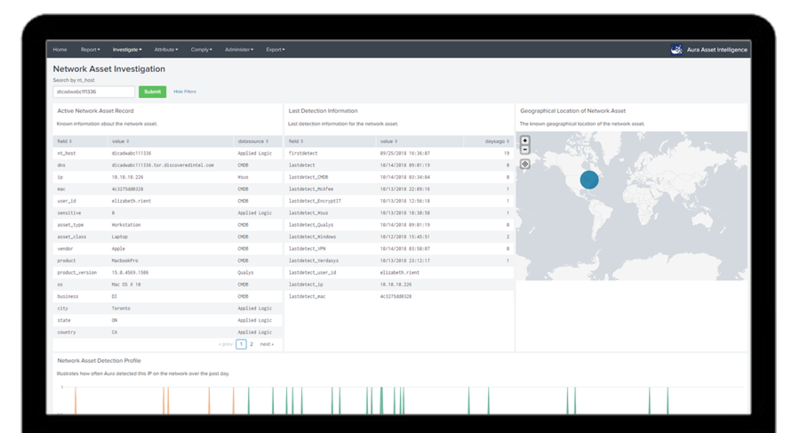 Leveraging our deep Splunk expertise and enterprise security experience, we created Aura AI. Utilizing a unique combination of unsupervised learning and patent-pending logic we, ensure security teams have the best chance of discovering unknown devices and can quickly act to protect and manage them. According to The Ponemon Institute report Oct 2018, the financial impact of a successful attack is on the rise; up from an average of $5 million in 2017 to $7.1 million in 2018. An important tactic to prevent and mitigate damage is to understand and effectively manage all assets that are attached to your networks. Aura AI provides a complete view of connected assets across your organization to help stop threats before they happen. Aura AI leverages a wide range of inputs to detect assets that have not been previously been identified by other services. Real-time data inputs and analysis ensure that asset profiles are continually updated. 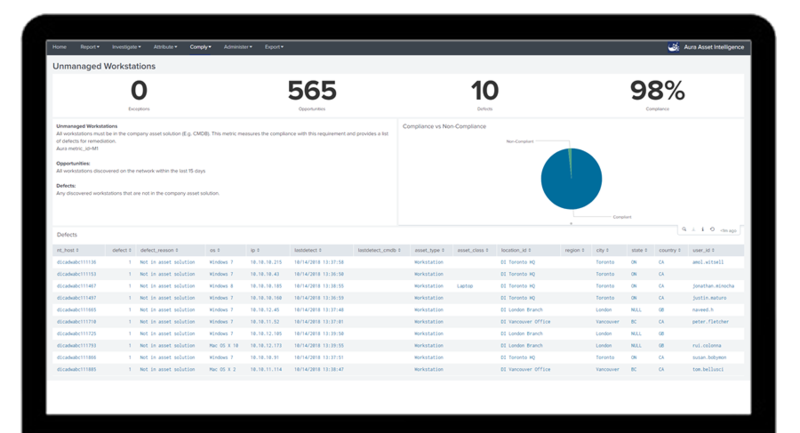 All data processed by Aura AI stays within your enterprise Splunk environment; removing any potential security concerns that may be had with external, cloud-based asset detection service providers. High volume data from multiple data sources is often dirty; containing conflicting values or data formats. Aura AI correlates, cleans and normalizes all data, to provide the most accurate view into your assets. Aura AI is fast to install and can be fully deployed, discovering assets and providing superior levels of intelligence within weeks. This is unlike agent-based products, which need months to deploy and test. Aura AI supports and accelerates your security investigations. Instantly investigate assets or identities by several different data points. View asset personalities, understand asset and identity network activity, and view full IP address histories. Perform dynamic investigations; drilling down into assets and pivoting between identities and assets. Use Aura AI to expedite your forensic search capability and accurately attribute assets and identities at any point in time and against any event source. For example, you can use Aura AI to instantly find out who was associated with a historic firewall event, or even pull back all events attributed to a specific asset or identity over a given time range. Aura AI leverages advanced data correlation, unsupervised learning and a proprietary Enrichment IQ engine, to find and map relationships between assets and identities. Find probable subnet ownership, associate commonly used assets to individuals and visualize relationships between assets and identities. Aura AI has a scalable metrics framework with many in-built metrics, allowing you to quickly report compliance in real-time. For example, identify your exposure to unmanaged assets, find workstations without encryption, report on servers that have not been vulnerability scanned and more. 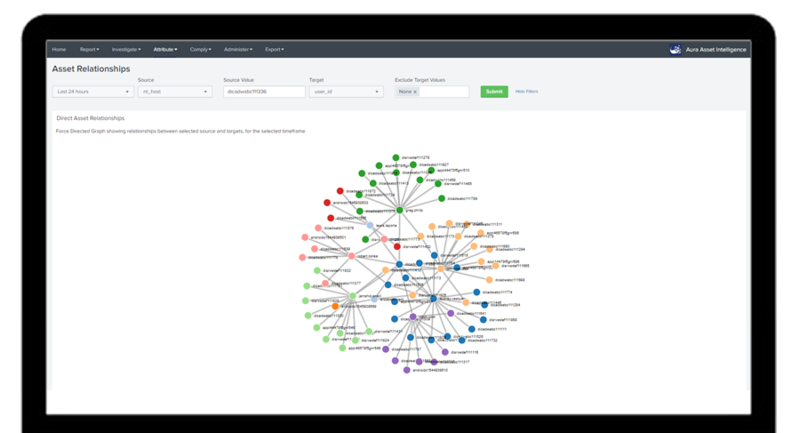 Aura AI integrates with all your other solutions, providing powerful asset intelligence to Splunk ES, Splunk UBA, Splunk ITSI and any other external solution you may have in place. 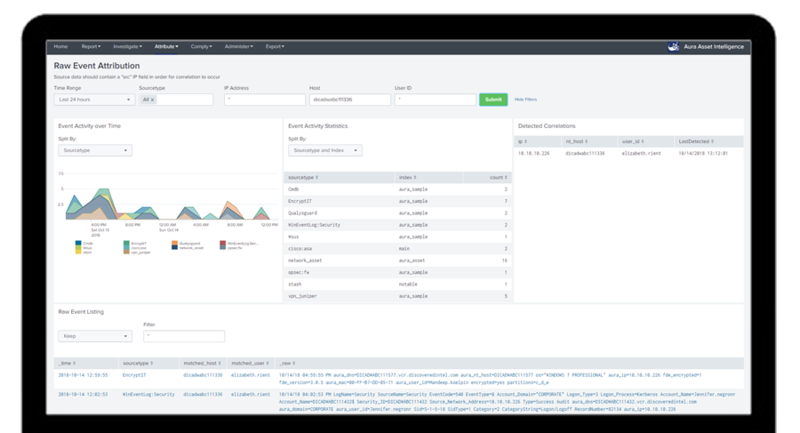 Aura Asset Intelligence also greatly enhances and increases the accuracy of your Splunk Enterprise Security deployment, through added capabilities and intelligence. Let us show you the power of Aura AI with a personal demo, to illustrate the value it will bring to your organization.